Welcome to the Halloween Mask Super Store! We have the MOST and BEST Halloween MASKS. Shop the widest selection of both manufacturers masks and rare Professional Grade Hollywood Studio Masks. 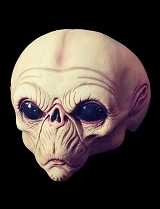 Great Halloween masks are available here and hard to find anywhere else. We have an influx of new masks and new cool studios for 2018! Our new masks ALONE would make a larger mask site than those "superstore" wannabes!!! This is the largest site of its kind. We are always seeking (and finding) new artists, studios, importers, and manufacturers. Our mask collections are arranged in categories, indexed by price and can be fully searched using our MaskFinder search tool. In getting ready for Halloween 2018, we have again deleted dozens of old Halloween Masks, and will once again roughly double the site size!